The 11th ENCALS Meeting in 2013 was held in Sheffield, United Kingdom from Friday 31st May to Sunday 2nd June 2013. The ENCALS executive committee would like to thank Professor Pam Shaw, Dr Sarah Langridge and Dr Janine Kirby for organizing this inspiring conference. 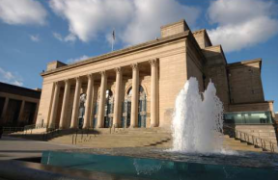 The ENCALS meeting 2013 was hosted at the Sheffield City Hall Venue. Here you can find the final program. Professor Clive Svendsen, (Thierry Latran Foundation Invited Speaker), Director of the Cedar Sinai Regenerative Medicine Institute, USA. Professor Pamela Shaw, Director of the Sheffield Institute for Translational Neuroscience (SITraN), University of Sheffield, Sheffield, U.K. Professor Stanley Appel, Peggy and Gary Edwards Distinguished Endowed Chair for the Treatment and Research of ALS, Director MDA/ALS Research and Clinical Centre at the Methodist Neurology Research Institute, The Methodist Hospital and Professor of Neurology Weill Cornell Medical College of Cornell University, USA. Dr Aaron D. Gitler, Ph.D. Associate Professor, Department of Genetics Stanford University School of Medicine, USA. Dr Christopher McDermott, Clinical Senior Lecturer, Sheffield Institute for Translational Neuroscience (SITraN) University of Sheffield, Sheffield, U.K. The ENCALS 2013 meeting has been approved by the Federation of Royal Colleges of Physicians for 12 CPD external points in the UK. Certificates are available for proof of attendance please contact Sarah Langridge (S.J.Langridge@sheffield.ac.uk) if you do require a certificate but did not indicate this at registration.